Who says going out for walks is only for dogs? This is my cat Mishi in her stroller. I think cats deserve to go out for walks too. They enjoy it so much, and being the nervous little creatures that they are keeping them safe inside a stroller is a great idea! There's two models for this stroller but I decided to go with the modern one front wheel. I like how it's so easy to fold, it's not heavy, has a cup holder, and has a storage area underneath to bring along anything you like. Be warned, people will often stare! They will watch in amazement, or give you that 'Awww, look at that kitty!' compliment. When I first saw this I thought it was so funny!! Never thought this even existed! 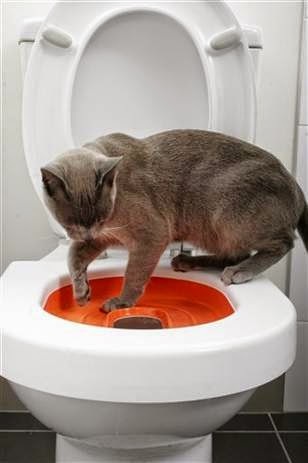 The Litter Kwitter is a training system to teach your cat to use the toilet! No way! I was watching videos of cat's using the toilet on YouTube when I came across a video with the Cat Toilet Trainer. How cool! I thought it was a great idea, and one day shopping at PetSupermarket I noticed they had it and I ended up buying it! This video summarizes how it's supposed to be used. They claim after a few weeks your cat will be a toilet expert! Now you can have amazing conversations with your family and friends about how good your cat is at using the toilet. Want to make your cat feel like king or queen of the house? This is the perfect gift! 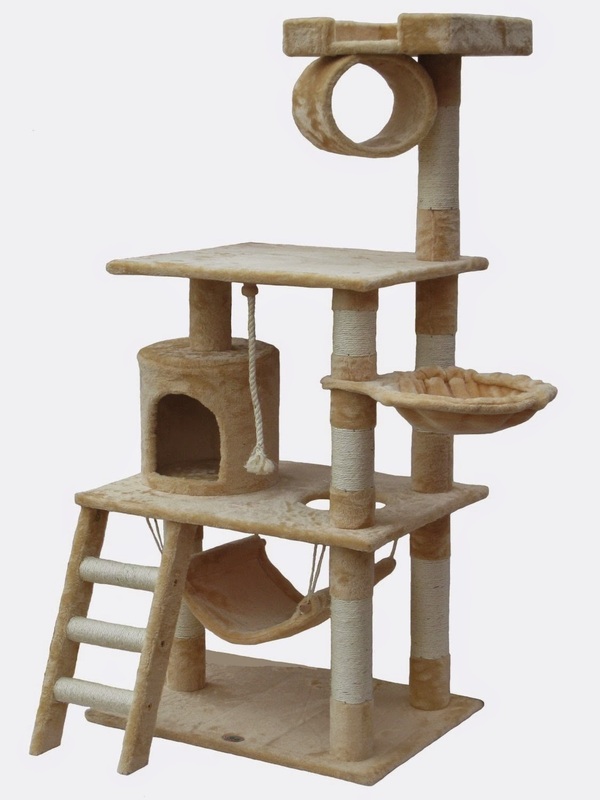 I looked through so many cat trees but this one caught my attention. This cat tree is available on Amazon and I really like the subtle colors. I like how it has a little bit of everything. A ladder, a cat hammock, a piece of rope to play with, and it doesn't seem to take too much space. For one cat it seems to be perfect, and even up to three cats. I think I will buy this one for my cute Mishi once we get our a new apartment and we settle down. I also like this one and this one. MORE - If you're looking for a great shampoo for your pet I recommend Espree Natural. I love this product for being natural and it has a subtle floral scent, nothing too crazy. 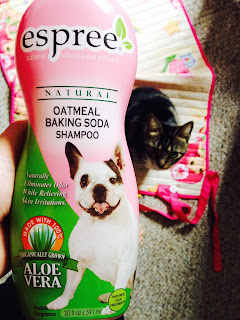 This brand offers many shampoo options but I went with the pink bottle that has oatmeal and baking soda. This shampoo naturally eliminates odor and relieves skin irritations. Some of the ingredients on the back label are organic aloe vera, coconut based cleanser, jojoba, and Vitamins A, D, E. I also love this brand for being cruelty-free, biodegradable, has no parabens, and no chemical dyes. It's also puppy and kitten safe! To me this is like a magic potion, all the best in one bottle!! I truly recommended it! What do you think? Did you like any of them? I hope you found these to be the perfect cat gifts! This will surely make your little creature feel special. Until next blog post! I love that cat tree. I've been looking for a good one for my babies, I think I'm going to order this one. I'm sure they'll love it. The hubs is totally convinced we could teach one of our cats to use the toliet instead of the litter box. I may have to get that for him as a gag gift. I would love a new cat tower too!! Fun list. This is amazing! I love that there are so many products out now for not only children but our fur babies too!